What to Do With Joselio Hanson? Last year during training camp, I talked about how Joselio Hanson could be on the chopping block. That didn’t come to pass and Hanson had a pretty good year overall. He didn’t have gaudy stats, but his solid play was a welcome respite as the rest of the cornerbacks not named Asante Samuel looked like turnstiles on gameday. Yet here we are again, debating Hanson’s merits because of a bigger lockjam at cornerback than last year. With the additions of Nnamdi Asomugha and Dominique Rodgers-Cromartie, the Eagles now have three starting-caliber corners. That pushes Hanson down to dime back, a role that doesn’t put him on the field very often. According to Football Outsiders, the average NFL team only ran eight percent of its offensive plays with four or more wide receivers. And against the Eagles defense last season, they only ran formations like that a miniscule three percent of the time. Is it worth paying Hanson about $2.2 million for that small bit of playing time and some injury protection? Plus, if Hanson is going to be active on game day as the fourth corner, he’d have to play great special teams. Last year though, Hanson contributed very little in that area. 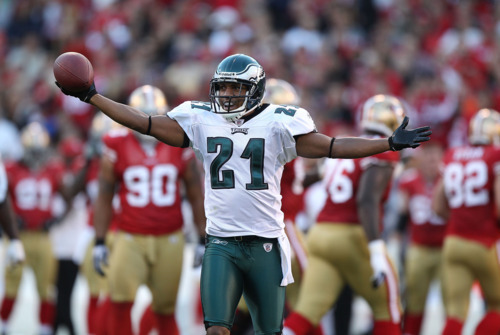 Meanwhile, the Eagles have three younger cornerbacks who have all shown promise. Trevard Lindley was last year’s fourth round pick. He may not fit this system any more, but it would be rare to see him go so soon. The Eagles drafted Curtis Marsh this year in the third round, so he’s not going anywhere. Then there’s Brandon Hughes, who has impressed in practice since the Eagles signed him off the Giants practice squad late last year. I anticipate that the Eagles will try to keep six corners, but even so there’s not enough room for everyone. And with a Samuel trade looking more unlikely by the day, that means the team will either have to cut loose one of its young guys or find a suitor for Hanson. At this point that last possibility looks relatively likely. I’d give it a 60 percent chance that Hanson is with another team by next week. If that’s the case, I wouldn’t mind trading him within the division, even to the cornerback-needy Giants. Hanson is a solid player, a great nickel back — but he’s not starting caliber. If the Eagles can get a mid-round draft pick in return for a guy who is unlikely to play much this year, that’s a win. Of course, I also speculated about Hanson last year, and nothing ever happened. So maybe he’ll stick around once more. Tagged with Philadelphia Eagles, NFL, Cornerbacks, Joselio Hanson, Training Camp, Preseason, Asante Samuel, 2010, Nnamdi Asomugha, Dominique Rodgers-Cromartie, Trevard Lindley, Brandon Hughes, Curtis Marsh, Trade. August 31, 2011 by Brian Solomon.